Somebody call the Fire Department because it’s about to get #hot up in here! If you’ve lived out West you know that fall does not really bring the changing colors to the leaves like out East but rather the terrible fire season. Our firefighters work hard to put out the wildfires that rage through the brush lands of California, and unfortunately this year because of our terrible drought I fear it may be worse than before. Thus, let’s feed those firefighters! 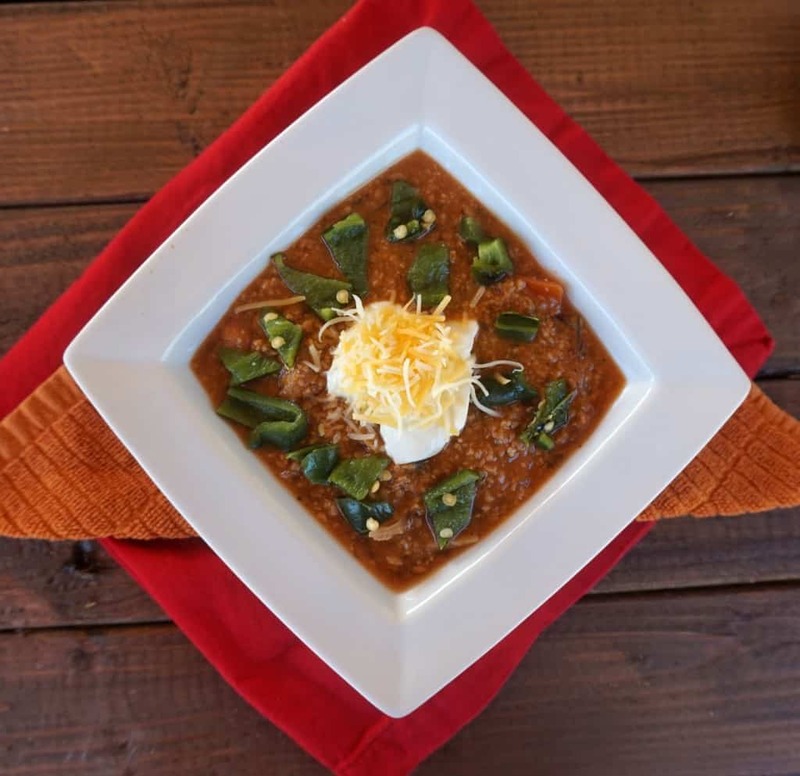 Enter… Smoked Firehouse Chili. 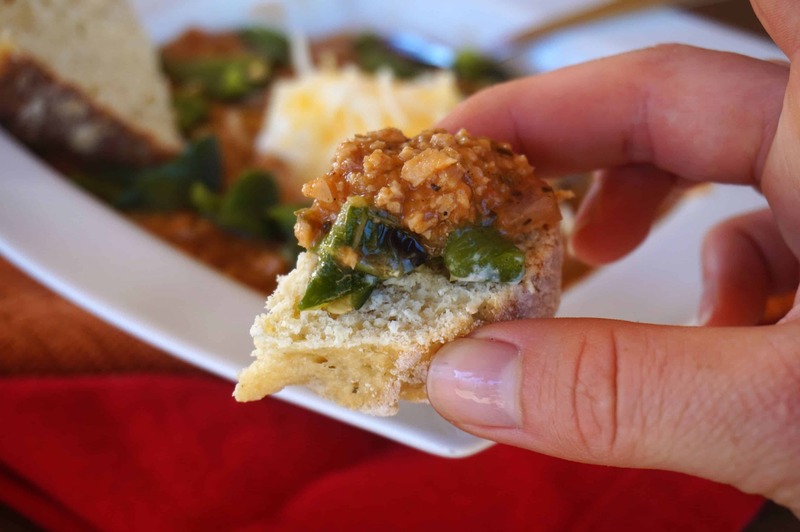 I have to admit, this Smoked Firehouse Chili is a perfect fit for those firefighters. Why? First off, Mr. CEO and I happen to be friends with a fireman who loves spicy things. Whenever he comes over, it’s like a spice fest in our kitchen! Trust me, I’m not complaining, you just need to wear goggles so you don’t cry. Nonetheless, anything spicy he always tells me is a winner in the fire house. I like to top this recipe with a little non fat Greek yogurt to give it a sour cream like feel (another #simpleswap!) and a sprinkle of sharp cheddar cheese. You can always bake off some potatoes and top them with this chili too. It’s a different twist on that Sweet Potato Chili from last year in a sense. Or, toss some tortillas in the oven. Cut them up and you have a non-traditional take on nachos. Whatever you prefer, I promise your taste buds will be satisfied with this combination. Have a sweet tooth post-chili session? Me too! Check out Healthier Halloween Treats to whip up this month, you’ll keep your heart healthy while satisfying that craving. 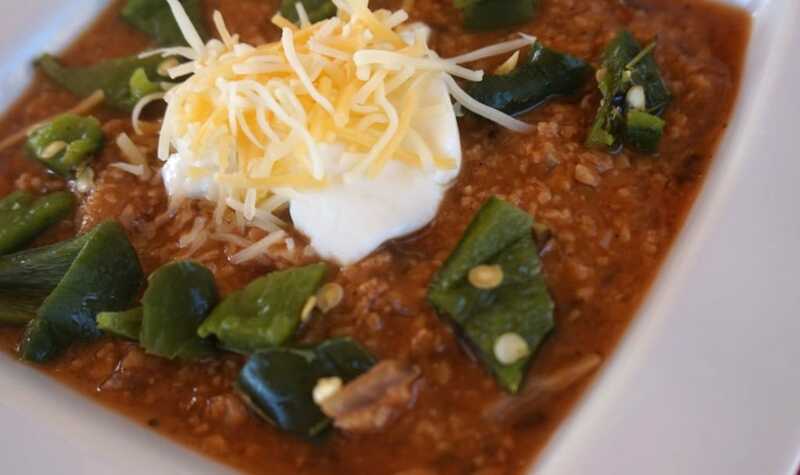 What’s your favorite way to eat chili? Plain Jane, Loaded Potato, Macaroni? While waiting for water to boil, combine thyme, basil, mustard powder, jalapeno powder, cayenne pepper and paprika in a small bowl. Remove from heat and add 2 cups of the TVP, stir until completely mixed. Slowly stir in the spice mixture to the TVP. In a crock pot set to low heat, add all ingredients together and stir. Let simmer for at least two hours for the flavors to meld together. Remove and enjoy with a fresh biscuit! Woohoo! You are welcome- I hope he enjoys! It’s a chili kind-of day obviously. I love the addition of tomatillos and serranos. i am sucker for peppers of any kinds! Ha, me too! 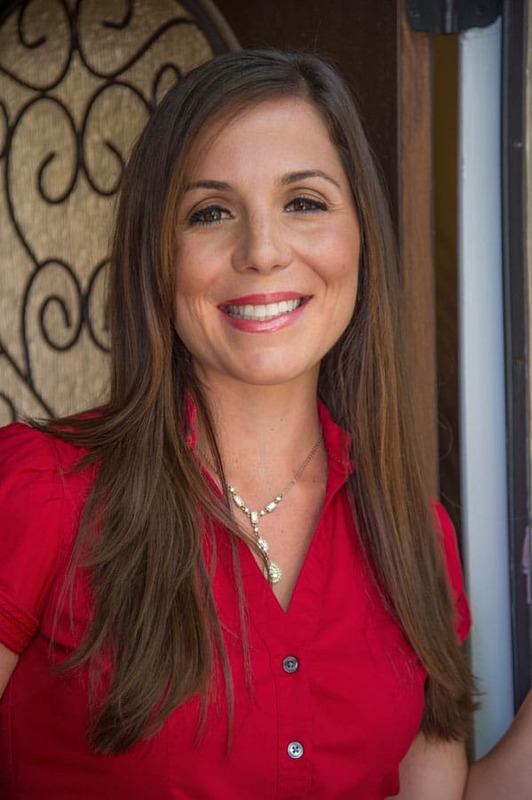 I agree, chili, sweat pants and chocolate… count me in! Ah thanks Rachel! I promise, super Heart & Healthy… double win!!! I kid you not,I have been craving chili since this afternoon! Your version sounds delicious-the spicier the better for me, with LOTS of chopped onions and a little grated cheese on top. Yum!! Your wish has been granted. Choose between a hearty chicken or turkey.. you’ve got options! 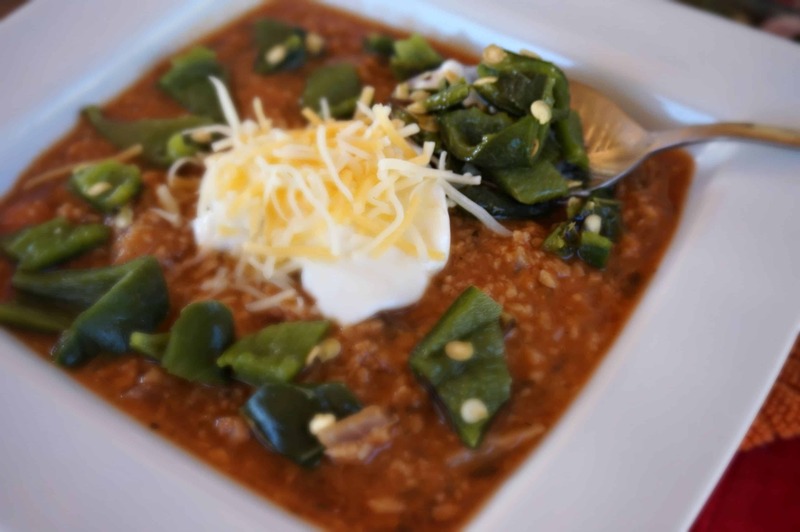 The lovely Nutritious Eats has a fabulous chicken chili today on the blog as well! 🙂 Enjoy! LOL 🙂 Bring on the HEAT! Hi Liz! I am sort of a wimp so I like mild chili! This recipe sounds like a breeze once you gather all the ingredients. 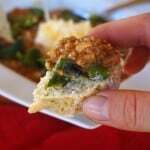 Question: where do I get texture vegetable protein (TVP)? any particular brands or stores? LOL- that’s okay! Any chili is good chili my book :). The TVP I like is a Bob’s Red Mill brand. You can pick it up at Sprouts for sure in San Diego. Even Big Lots sometimes has it on sale! that looks spicy! My husband would love it, but need to tone it down for the kids. I haven’t actually used TVP before – did you find it very salty? 🙂 You can definitely tone it down while still adding a ton of flavor. TVP is actually very low sodium, less than 50 mg for the entire package! I thought my husband would make that grin face when he tried it, but I was surprised he fell in love! Plus, it’s very economical in comparison to animal proteins.